The parish of Shelton contains the villages of Shelton and Hardwick, as well as the Harris Green and Shelton Common areas. The parish is 1.7km east of the course of the Pye Roman Road, now largely overbuilt by the A140. Shelton parish is in the South Norfolk local government district, and was enlarged in 1935 when it gained Hardwick village and associated land, which had previously been a separate parish. The name ‘Shelton’ is derived for the Old English for a ‘settlement on a shelf’, and the name Hardwick from the words for ‘herd dairy farm’. There is a surprising amount of prehistoric evidence from this parish considering the general paucity of objects and sites. A concentration of fire-cracked flints (NHER 18389) was discovered in the 1950s or 1960s to the south of Hardwick village, and worked flints (NHER 10173, NHER 18390, NHER 28206), including a Neolithic axehead (NHER 33892), have been recovered from a small number of sites across the parish. The only object recovered from the Bronze Age is an awl from the northwestern border. Frequent metal detecting in a limited number of fields north of Shelton village has recovered a number of Roman objects. These include brooches, bracelets and a silver finger ring (NHER 30194, NHER 34604), as well as a number of coins, harness and furniture fittings (NHER 32302) and toilet items (NHER 32302). Further investigation in other parts of the parish may yield similar numbers of objects. Evidence for the Saxon period is limited. There is a possibility that St Margaret’s Church at Hardwick (NHER 10189), discussed later, may have derived from the Late Saxon period, but that is currently speculation. Early Saxon objects, such as a buckle and bridle bit (NHER 32302) and strap fittings (NHER 34604), are also limited to the north of the parish where intensive metal detecting has been undertaken. The site of Shelton Hall (NHER 10175) and adjacent Dark Park (NHER 10182) are deeply riven with moats and earthworks, and it is here that the earliest medieval manor is believed to have been. Apart from the extensive earthworks no building remains from this period, but a new hall (NHER 10175) constructed in 1490 by Sir Ralph Shelton now dominates the site. This hall was demolished around 1790, although the original Great Barn survives, as does a 16th century jettied house, thought to be a Stewards house. The Sheltons went on to dominate the parish for the next 500 years, and Sir Ralph’s legacy also saw the construction of the majority of the present building of St Mary’s Church (NHER 10188). It is one of the best examples of a church built in the Perpendicular style in Norfolk. Building finished around the end of the 15th century, although it was never fully completed to Sir Ralph’s plans. Of the previous church, the flint-built west tower and the Decorated style west window of the south aisle survive. Today, St Mary’s church is of red brick with stone dressings, and inside the soft red piers look almost impossibly thin against the shining white walls, an illusion of height increased by the thin but bright east window and the high white 18th century roof. The stained glass is considered to be some of the best in South Norfolk, with 15th and 16th century figures of the Sheltons in the east window and more medieval pieces in the north and south aisles. Previously an independent parish, Hardwick also has a church of its own; St Margaret’s (NHER 10189). It is a long building of largely Norman date, and until the storms of 1770 had a round tower that may have dated to the Late Saxon period. Both the north and south doorways are Norman, and there are a variety of windows from the medieval period, as well as a 15th century roof and porch of brick and flint. The church underwent a major restoration in 1882, and the east wall was rebuilt in 1986. Other medieval sites include a moated site south of Mill Lane in Hardwick (NHER 10763), as well as the site of Hardwick Hall (NHER 10772) itself; although the Hall dates to the 17th century, it sits within a medieval moated site. In addition there are some earthworks (NHER 29785) just north of Shelton Hall (NHER 10175), which may be medieval moat or toft boundaries, as well as some earthworks near Corner Farmhouse (NHER 29786) in the village of Hardwick, which may be the remains of a medieval hollow way or village green boundary. Objects from the medieval period include box and furniture fittings (NHER 30400, NHER 34604), pottery sherds (NHER 35143, NHER 33892) and coins (NHER 32302, NHER 34604), as well as a ring (NHER 33892) a jet chess piece (NHER 10174), and a ballista bolt (NHER 14701). Post medieval objects of similar types, including coins (NHER 34604), pottery sherds (NHER 35143) and metal objects (NHER 33892), have also been recovered. Of particular interest is a 17th century silver head-dress pin (NHER 28779) recovered from Hardwick village. As previously mentioned, Hardwick Hall (NHER 10772) dates to the 17th century, and like many of its contemporaries is a timber-framed building. Unlike them, the Hall retains the remains of a tower, an adjacent timber-framed barn of the same period, and a garden wall of the 18th century. Other buildings of importance, number just over twenty, are clustered in the villages, with a few in the agricultural lands to the east. Sundial Farmhouse on Shelton Green (NHER 14131) is of particular interest, having an early construction date of 1605, and possibly containing the remains of a late medieval hall house. In a similar position is Grey Gables (NHER 29687), on Common Road, which may also contain the remnants of a hall house and has a late chimneystack and parlour end of 1600. Evidence of the parish’s industrial heritage has also been recorded, and although the buildings have largely been destroyed, the location of the sites and information on their use has been recorded. As a result it is known that there were at least three windmills (NHER 15561, NHER 18020, NHER 18021) and an 18th to 19th century brick kiln (NHER 10764) in the parish. 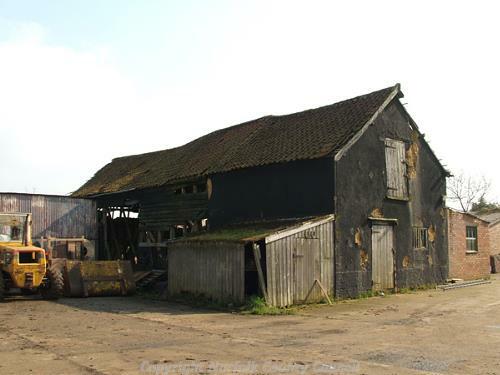 A 17th or 18th century timber framed barn (NHER 39829) at primrose Farm is still standing. There is also evidence from Britain’s more recent history, in the form of a World War Two pillbox (NHER 18351), and a World War Two USAAF airfield (NHER 21992). The pillbox is of the common type 22, and is situated high up in the hedge at the edge of the common, overlooking the road junction. The former airfield occupies a corner of the parish to the northeast, though largely in the adjacent parish of Hempnall. Ruth Fillery-Travis (NLA), 31st January 2006.